The trains in Kyoto are great, though they tend to just run north-south, it doesn’t have the density of Tokyo for basically 100% coverage by train. Our first stop was The Golden Pavilion at Kinkaku-Ji Temple. It was just a single bus ride from a stop not far from the hotel. A friendly bus driver asked where we were heading and confirmed we were at the right stop and a bus would be along shortly. Interesting frame and a Peugeot sticker. We got off the bus with a small hoard and followed them, assuming everyone was heading the same way we were, they were. We got to the road that headed up into the temple grounds, a woman in a uniform was trying to direct us straight up the road, to keep one side of the street for coming, and the other for going. It was early but there were already a lot of people already going. 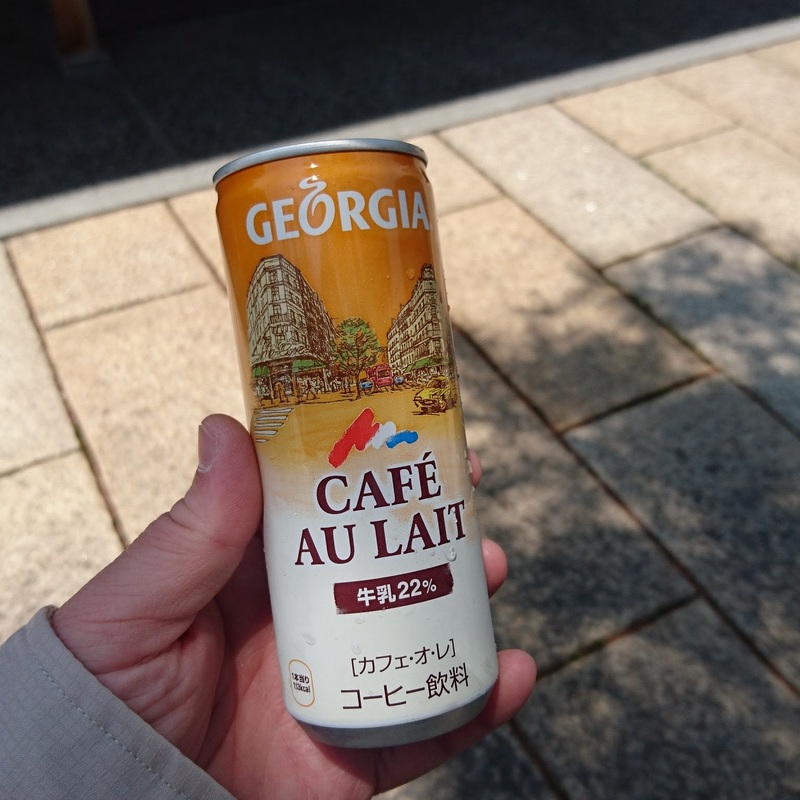 I hadn’t managed to find a convenient convenience store between the hotel and the bus stop and was rather eager for a can of coffee from a vending machine for breakfast. I tried explaining this politely, then just crossed the road at the lights. The other side of the road had a number of vending machines and small gift shops. 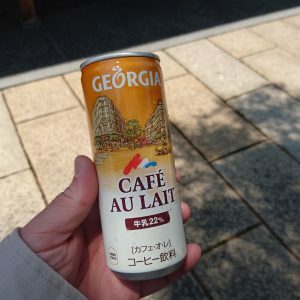 I was unable to locate my coffee of preference, but did find a can of larger coffee with milk. Heading into the temple grounds it was clear it was going to be busy inside. We lined up for tickets and followed the directions of all the signs we could read, joining the masses as we marched onward. The Golden Pavilion is quite nice. Sitting in the middle of a very small lake, or quite large pond (I haven’t decided which) I can see why everyone wants a photo of it. I wanted a photo of it. It was hard work jostling for position at the edge, trying to get a shot without an elbow or head from another tourist in the way. 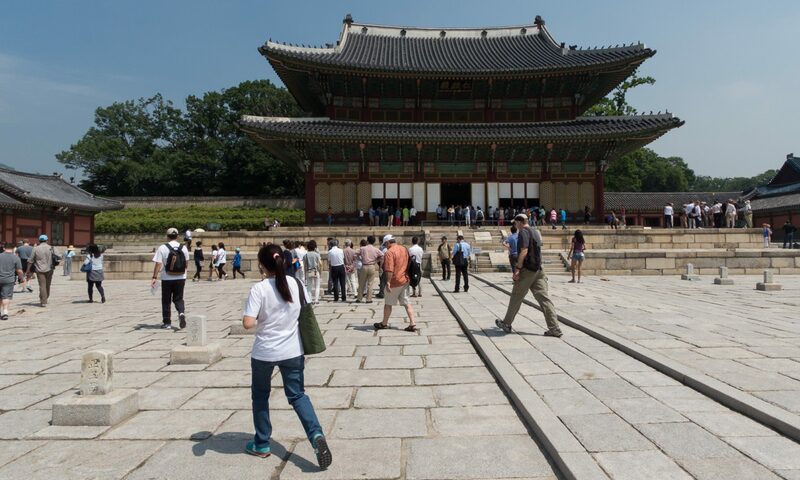 The situation was further complicated by the tourists wanting photos of themselves with the pavilion in the background. This of course leads to the situation where the person taking the photo needs to stand back from the rest of the group, with a clear path between them. The clear area between the group and the photographer is quickly filled when someone sees an unguarded area to walk through, though the vast majority of people politely pause on the edge of gap, waiting for the nod and thank-you before walking though. Based on the number of people who replied 谢谢 (xiè xiè) in Mandarin to me I think most of the tourists were Chinese. I am of course assuming they didn’t think I was Chinese so as to reply to me in Chinese. We completed our photo taking from various vantage points before heading off on the path around the very small lake or quite large pond through the rest of the temple grounds. At the end of the path there was a gift shop next to the tour coach parking, and a wall of vending machines.The gift shop had signs up saying you couldn’t take photos, though I did sneak one of some cookies – I assumed they really wouldn’t mind. The cookies were koalas after all. By now it was very close to lunchtime, I think, or at lest long enough since breakfast that we needed some more food. We headed back to the main road where the public busses were and found a tiny little cafe with somewhere between 2 and 3 items on their menu. It was run by an elderly couple who were probably even older than we thought. We squeezed into a table near the window and pointed at the menu. A series of smiles and polite nods and our order was taken. After eating we crossed the road and found a bus stop with just under a million others waiting in the sun. Checking the timetable and map there were a couple of numbers we could catch that would take us back across town to the next place we wanted to visit, Higashiyama Jisho-ji. The temple is set back from the main roads. There was a short walk past a number of restaurants and places selling drinks and gifts. We lined up for our tickets, followed the directions of the signs we could read and followed everyone inside. At the entrance is a sculpture / sand castle / pile of sand that represents Mt Fuji. 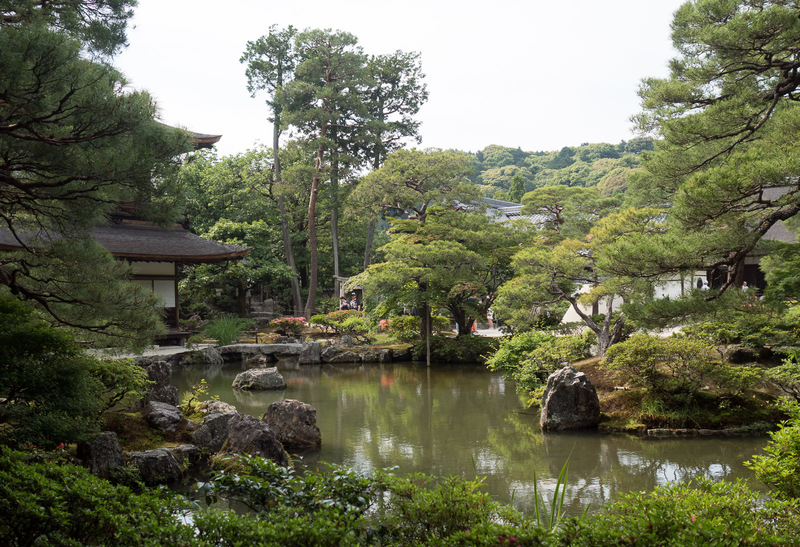 We walked through the gardens, around the large ponds (these were large ponds and not tiny lakes), and up the hill at the back of the grounds. At some point in this dad and I got separated from mum. We were taking our time, pausing for photos and videos of everything with at least two lenses in each location. We got to the gift shop near the exit, but couldn’t see mum. Of course I had the pocket Wi-Fi which had been powering all of our communications. Mum’s phone was useless unless she managed to find some Wi-Fi. Dad and I waited near the exit, occasionally sticking out head inside the exit to see if mum had made her way there. After a drink we decided that mum was definitely ahead of us and we walked back down the road towards where the bus stops were. We quickly found mum at the start of the street having a drink. We headed off along the Philosopher’s Walk towards another temple just down the road. This was much smaller, much quieter. There was as a good sized pond with a few fish in it. We did the rounds, but they seemed to be closing up for the day, and it was getting on. We consulted the bus timetable, the map, and our phones and headed through the quiet suburban streets back to the main road to catch a bus back to the hotel. Mum didn’t want too much for dinner that night and was happy with something from a convenient convenience store. Dad and I were a little hungrier and went looking for a restaurant. We found one with touch screens at each of the tables for ordering, as well as little tiny vending machines for small figurines that came out on pieces of card about the size of a credit card that you put together.